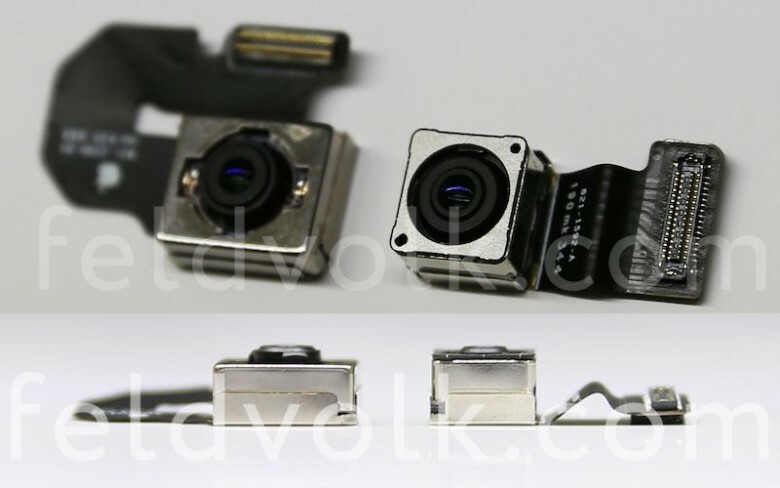 iPhone 6 camera module (left) next to the iPhone 5s camera (right). Apple will reveal the full details of the iPhone 6 in just 4 days, but a set of leaked images from Feld & Volk appear to confirm that Apple’s biggest iPhone will come with optical image stabilization. 5.5-inch iPhone 6 will come with optical image stabilization. The luxury Russians iPhone modders – who have already built a ‘working’ iPhone 6 out of spare parts – managed to get their hands on the image sensor destined for Apple’s 5.5-inch iPhone, and while Apple has thinned down the module’s thickness, it appears to be larger than that on the iPhone 5s. Previous rumors have claimed that Apple will keep using optical image stabilization on the 5.5-inch iPhone 6, but may switch to electronic stabilization for the 4.7-inch iPhone 6. The leaked images also show that 5.5-inch camera lens will protrude from the body like the 4.7-inch iPhone 6 camera module. Feld & Volk say that the 5.5-inch iPhone 6 camera module is too big to fit in the smaller iPhone 6 case they have, adding to the evidence that image stabilization will be one of the differentiating factors between the two new iPhones. The firm also scooped up a few more new parts as well, including the mesh grills for both the speaker and microphone holes in two color options. They also have a close up shot of the iPhone 6 power button with a new rubber seal that will make it more durable. Apple’s keynote for the iPhone 6 will start at 10am PT at the Flint Center in Cupertino. The iWatch is also expected to make an appearance at the event, along with Apple’s new payments system.